Considering outstaffing or outsourcing software development? Read this detailed comparison and discover the pros and cons of both options. We will explain in detail what these two terms mean and which option is better in your case. We will also explain how to find the right outstaffing or outsourcing firm for your business. Let’s be honest, almost all US and UK-based businesses who deal with software use the services of software development company in countries like Ukraine or India. The global IT outsourcing market currently exceeds 85.6 billion dollars. The largest tech companies such as Google, Oracle, Facebook use this option as well. Now, if these giants outsource, wouldn’t it make sense to do so as well? You might be still unsure and wonder why you should. So let us explain why before we compare the pros and cons of outstaffing and outsourcing. There are numerous reasons why businesses begin outsourcing and outstaffing. We are going to highlight the two most popular reasons. The most obvious benefit is lower development expenditures and significant costs savings without sacrificing development quality. If you can get a software project done at the level you need for less money wouldn’t you do it? Exactly. That’s why so many businesses outsource and outstaff. It is a big mistake to believe that great developers can be found only in Silicon Valley. There are many well-respected IT-universities around the entire world which can boast talented graduates who later become successful software engineers. Qualified developers may be found almost anywhere. The only difference is in their salaries – they tend to be much lower overseas than in the US or UK. The quality of development, however, remains the same or even in some cases appears to be much better. When you don’t have in-house developers, there is less management work and headache. You don’t have to employ people, provide office space for them, take care of employee benefits, taxes, pension contributions, and so forth. This, in turn, lets you focus on much more important things in your business. Many companies completely outsource all their software and technology needs so that they can focus on their core competencies. 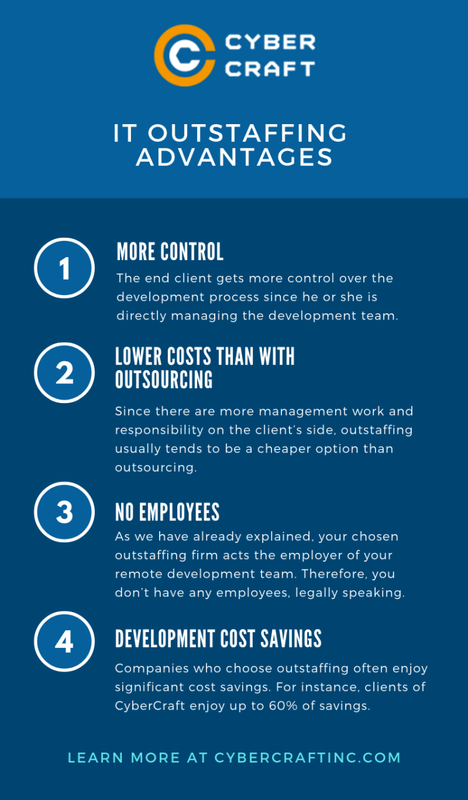 Having understood why outsourcing and outstaffing are so popular, let us briefly remind ourselves what these two terms imply, and what their advantages and disadvantages are. Software outsourcing is the process of hiring a software development team or individual to develop software for the end client. It implies complete responsibility for delivering the end product on the developer’s side. 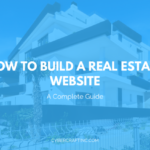 You, as a client, are only responsible for providing clear instructions and technical specification for the final product to the developer and following the agreed upon payment terms. The rest is the developer’s responsibility. If they fail to deliver the final product in accordance with your requirements, that is their fault, not yours. Let us explore in detail the advantages and disadvantages of this option. 100% responsibility on the developer’s side. As we’ve said, the developer is 100% responsible for building the product in complete accordance with the client’s requirements. If there are any bugs/technical issues, etc. the developer is held accountable, not the client. (Almost) no management work. The outsourcing company takes care of the management side itself. You don’t have to directly manage the development team. All you have to do is to provide clear requirements for the team and they will take care of the rest. No need to directly employ people. Once again, hiring and management of developers is not your responsibility. This means you don’t have to directly employ any people. The chosen outsourcing firm acts as the official employer of the developers working on your projects. Legally speaking, you are not having any business relations with developers, only with the development company. Lower development costs compared to employing in-house developers. Almost in all cases, outsourcing is cheaper than having in-house developers, especially if you’re based in the US, Canada, the UK, or some other country with high salaries. Faster development. Outsourcing also quite often provides a better speed of development. Higher costs than with outstaffing. Less management headache and responsibility results in higher costs compared to the outstaffing model. The hourly rates and overall expenditures tend to be higher. It is important to take into account the management efforts from the outsourcing company’s side as they usually have to appoint a manager for your project. Less control. Since a client is not really involved in project management, he or she correspondingly has less control. Depending on the chosen software development model, the degree of involvement will vary. Possible communication issues. Since in most cases your remote team members are not native English speakers, there may occur certain communication issues or misunderstandings which might, in turn, result in serious errors or even project failure. Therefore, it is vital to ensure that your chosen team members speak and understand English well enough before work begins. It is a good idea to check if they have corresponding certificates which demonstrate their level of English. Risk of data leakage. Your chosen development partner will have access to confidential information, especially the code itself. If you happen to deal with real scammers, they may sell your code to third parties. Therefore, it is important to sign a non-disclosure agreement (NDA) and take all necessary measures to prevent data leakage. Possible worse quality of development. Sometimes it is possible to get a much worse quality of code with remote developers. This may occur if you don’t approach the selection process diligently and carefully enough and select the wrong team to work with. It is important to ensure that your team is qualified enough and has successful experience with similar or identical projects in the past. 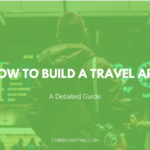 We will briefly explain how to find that kind of team later in this guide. 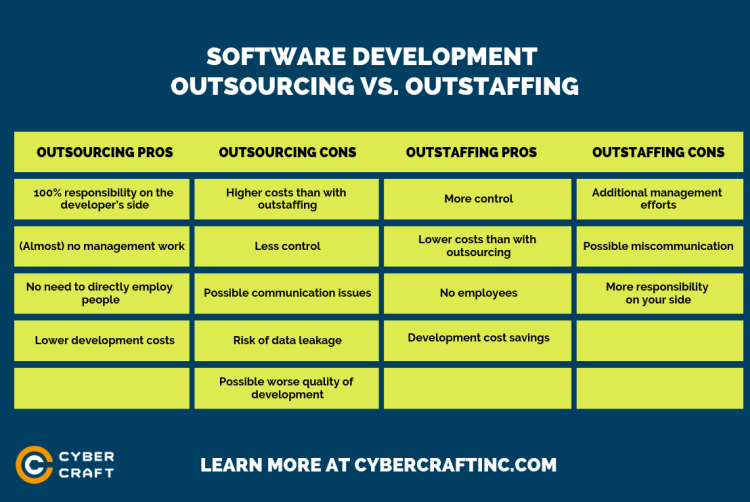 Now that we figured out what outsourcing is and what its pros and cons are, let us analyze the second option on our list – IT outstaffing. IT outstaffing is the process of hiring remote software developers and directly managing them while they are officially employed by another company (outstaffing company). Your chosen outstaffing company acts as the official employer of those developers who takes care of all their needs as an employer (providing office space, taxes, social security contributions, etc.) and mediates your relationships with the remote dedicated development team which builds the final product for you. In recent years, there have appeared numerous IT outstaffing agencies which provide dedicated development teams to clients around the world. One of the reasons this happened is because more and more companies switch from classic outsourcing to outstaffing instead. Outstaffing and outsourcing can be compared to driving a car yourself vs. riding with a driver. The car does not belong to you, you just decide if you wish to drive it yourself or use a driver. You, as the client are responsible for managing the team, providing clear requirements and instructions, and strictly following the agreed upon contract’s terms. The upsides and downsides of this option are different from outsourcing. Let us see what they are. More control. The end client gets more control over the development process since he or she is directly managing the development team. Lower costs than with outsourcing. Since there are more management work and responsibility on the client’s side, outstaffing usually tends to be a cheaper option than outsourcing. No employees. As we have already explained, your chosen outstaffing firm acts the employer of your remote development team. Therefore, you don’t have any employees, legally speaking. Development cost savings. Companies who choose outstaffing often enjoy significant cost savings. For instance, clients of CyberCraft enjoy up to 60% of savings. Additional management efforts. Management of the development team is 100% under your control. 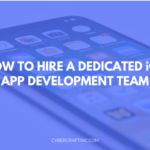 This means you have to posses corresponding skills and qualifications to manage a development team and software development process or hire somebody who will do it. If you cannot afford it, then outstaffing is perhaps not the best choice for you. Possible miscommunication. Just as in the case with outsourcing, there is a possibility of miscommunication if your developers don’t know English well enough. More responsibility on your side. More control implies more responsibility. In the case with outstaffing, you have much more responsibility for the final outcome as you are the one who manages the team. Back to our car example, you are the driver of the car, you decide where to go, so where you end up is mostly your responsibility. Now that we have analyzed both the pros and cons of outstaffing and outsourcing, let us figure out which model is best for your business. Outstaffing vs Outsourcing: Which Option Is Better? Unfortunately, there is no universal answer to this question. 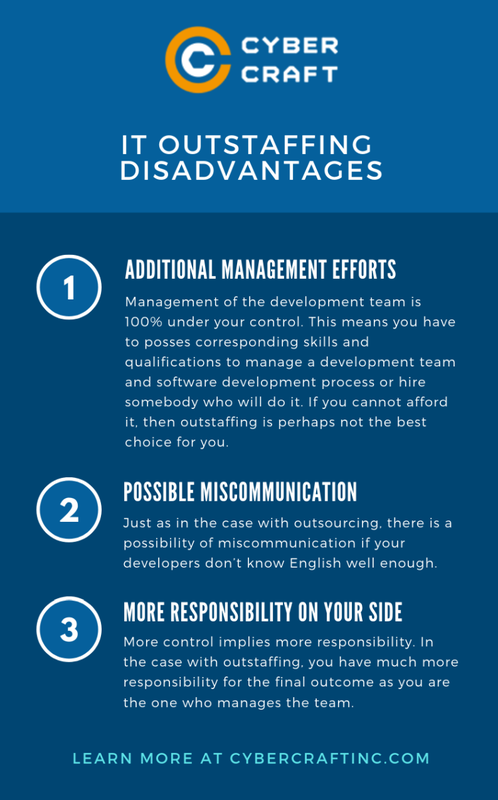 If your project is of large scope and we’re talking long-term, plus you have qualified managers who can successfully manage a remote development team, then outstaffing is the right option for you. Otherwise, outsourcing may be a much better option for you. Once you know which option is the right one for you, the next logical question is how to select the right software development partner which is what we’ll answer next. How to Find the Right Outstaffing/Outsourcing Partner for Your Company? Fluent command of English. If you wish to avoid miscommunication, you’d better ensure that your potential developers all have a fluent command of English. Close location. Your team shouldn’t be too far away. 7-8 hours of time zone gap are okay. If you are in New York, for example, then working with a team in Ukraine or Belarus would be fine, but India or Pakistan would be too far. Certification. Check if your developers have any official certifications, preferably from companies like Microsoft or Google. Proven testimonials. Examine their testimonials from past clients. Check their client list. It is preferable that their client list includes some well-known brands. Clear and transparent terms of services and payment. This point is self-explaining. The bottom line is, take your time, be patient and diligent when searching for and reviewing potential development partners.